TRENTON, NJ - (@TheComedyNews)) - A fat guy in New Jersey announced to a nation of concerned citizens that he will not be running any time soon. "This is typical behavior by the overweight and out of shape," a concerned jobless mother of 9 lamented. "We didn't know his name, but he looked mighty snug and sweaty in his suit. He could have been a true inspiration to our concerned, fat nation." The fat guy from New Jersey spoke to a crowd of reporters who had braced themselves for what they were certain would have been the first sight of the fat guy running. "We understand that it's trite, overdone, and not anyone's business to tell a fat guy that he should be running," prefaced one reporter. He continued, "...still, all the experts agree, you should definitely run." 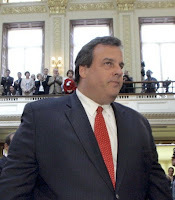 Immediately following his announcement not to run, the fat guy from New Jersey pulled out a turkey leg from his breast pocket, took a big bite, and shouted, "viva Jersey!"